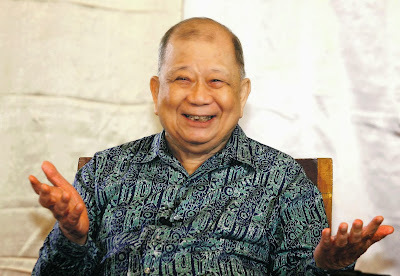 Seeing Chin Peng's portly self in his later years, few would believe that this was the man who once waged a bloody Communist insurgency in the Malaysian peninsula. For years, he fought with his brothers-in-arms but was finally forced into exile in Thailand. Others who fought alongside him, both physically and ideologically, were similarly forced to flee into exile around the world. In recent years, Chin Peng fought to return to Malaysia and was denied entry every single time. Such is the fate of a man who was at the losing end of history. Maybe it is in his honour that even his ashes wrecked such apprehension in the BN government that they were denied entry for the fear of reopening old wounds. Now in his death, with his former comrades scattered all over, tributes began to trickle in for a man they once revered and struggled alongside with. From distant London, a flower wreath sent by Tan Wah Piow, rekindled a long forgotten connection. In this dog eat dog capitalistic world that we live in now, such loyalty and sentimentality is a breath of fresh air. Self-exiled in the UK, constantly fighting for his innocence against the Singapore government's charge of being the mastermind behind the Marxist Conspiracy, he once stated vehemently in his book Let the People Judge that he was no communist. 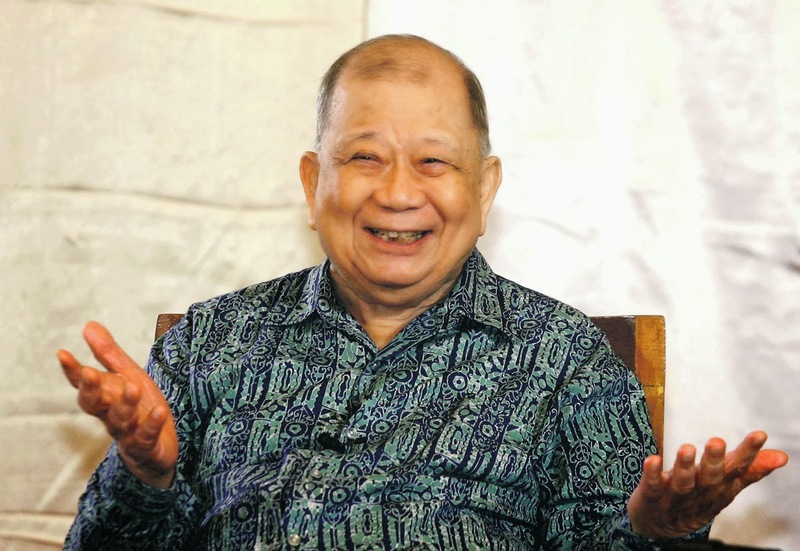 In the same vein, Wah Piow's sentimental self was already evident in 1982, when despite his own trying circumstances, he was instrumental in securing political asylum for another five members of Communist Party of Malaya (CPM) in Europe. Be it Communist or Nationalist or Socialist, the display of camaraderie that neither time nor distance can hope to extinguish is indeed worthy of a mention. "Former Singapore student movement activist Tan Wah Piow, who went into exile in the United Kingdom in 1976 and had a close relationship with former Communist leader Chin Peng, sent a wreath to the latter's wake today. From self-exile, he instigated a movement to abolish the Internal Security Act (ISA) in Malaysia and Singapore and asked for the release of Communist Party of Malaya (CPM) members. Tan was a student at the University of Singapore in the 1970s and became the president of the student's union in 1974. In the same year, he was charged by the Singapore Government for organising and taking part in an illegal gathering and sentences to a one year jail term. Information revealed that Tan was influenced by Marxism when young and therefore became passionate about student movements. 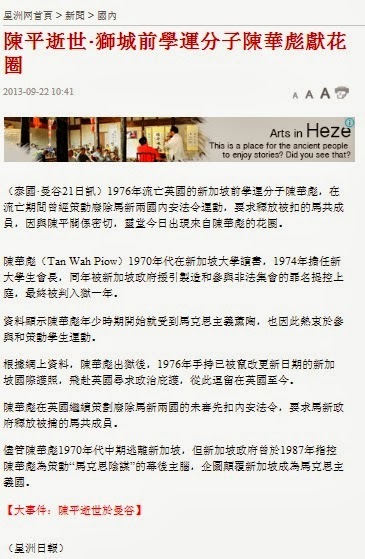 Based on online information, after his release from jail in 1976, Tan flew to UK on a Singapore passport with forged renewal endorsements to seek political asylum and stayed there till today. In the UK, he continued to lobby for the abolishment of the ISA and release of CPM members. Although Tan fled Singapore in mid 1970s, the Singapore Government named him as the mastermind of the Marxist Conspiracy in 1987." Side Note: Ms Teo Soh Lung, one of those arrested during the Marxist Conspiracy, shared her views on Chin Peng's passing. 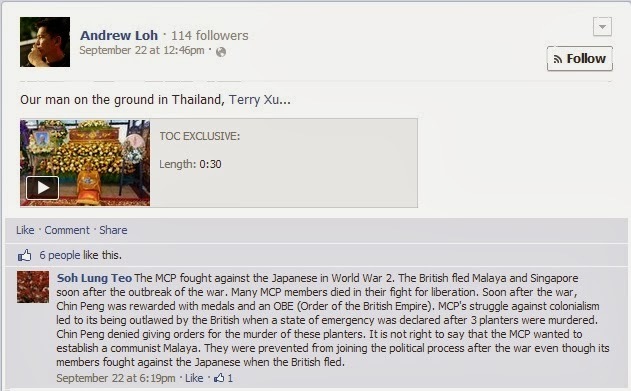 Ms Teo: "it is not right to say that the MCP wanted to establish a communist Malaya. They were prevented from joining the political process after the war even though its members fought against the Japanese when the British fled". Perhaps it would be more accurate to say that the MCP did try to participate in the political process but they were repeatedly outwitted by the English-educated neo-colonialists, namely LKY and his comrades. The MCP did participate in the political process, first through Lim Chin Siong when he shared the leadership of PAP with LKY, and later through Barisan Socialis when they participated in the 1963 General Elections; but sadly chose to boycott parliament thereby depriving Singaporeans of an alternative to which we still seek today. Hence, MCP members had two major forays into the political arena and both ended in disappointment.